This hard drive eraser provides standalone, simultaneous drive erasing for up to four 2.5 in. or 3.5 in. SATA hard drives or solid-state drives. Unlike hard-drive docking stations or adapters that require a computer connection and software to erase drives, this hard drive sanitizer features standalone erasing that doesn’t require a host computer. This avoids the hassle of connecting your drives to a host computer and protects your drives from external security threats like remote data access. Using industry-recognized erase modes, the hard drive eraser securely sanitizes the data from your 2.5 in. or 3.5 in. SSDs or HDDs. It supports nine erase modes including Quick Erase, Single and Multi-pass Overwrites, Custom Erase, Secure Erase and Enhanced Secure Erase. The Multi-pass Overwrite (3-Pass Full Disk Overwrite) erase procedures meet the requirements of DoD (5220.22-M) standards. Support for a variety of erase modes makes this drive eraser perfect for virtually any professional application. Single-Pass Overwrite is ideal for IT technicians and system administrators who decommission and repurpose old hard drives, while Quick and Secure Erase, Single Pass Overwrite and Multi-pass Overwrite modes (meeting DoD standards) are ideal solutions for research laboratories, health offices, law offices and accountants who manage sensitive data and require secure erasing to avoid potential privacy breaches. The hard drive eraser features convenient menu navigation that ensures fast and efficient performance, with push-button operation and a built-in LCD display that clearly identifies the erase modes and task status. You can also connect the eraser to a computer to quickly access the drive that's connected to port-1. 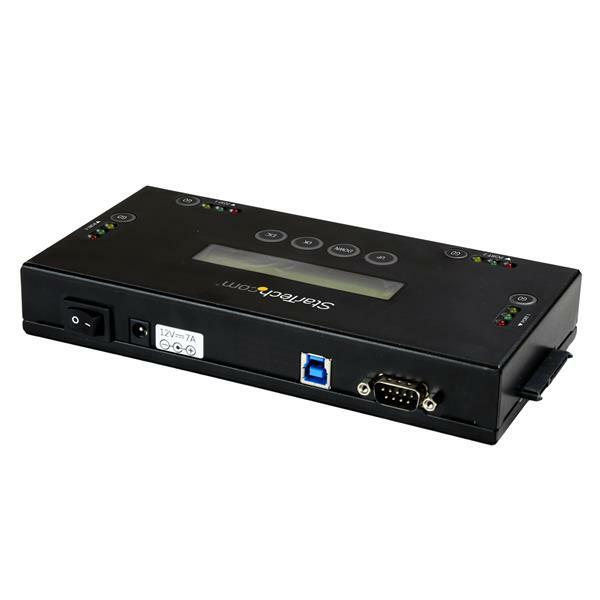 To ensure your records are complete for auditing, the hard drive eraser features a 9-pin serial port that can connect to a serial printer to provide on-demand erase logs. The SATERASER4 is backed by a StarTech.com 2-year warranty and free lifetime technical support. Receipt printing through the RS232 serial port requires a printer which supports the ESC/P printer control language. Can I duplicate from a larger source drive to a smaller target drive? StarTech.com hard drive and flash drive duplicators perform a sector by sector copy, which means that the target drive must be the exact same size (down to the sector) or larger than the hard drive or flash drive that is being copied. During a sector by sector copy, each individual sector is copied over to the target drive, regardless of whether or not any data is present. A 500 GB hard drive with 50 GB of data on it will take the same amount of time to copy as a 500 GB hard drive with 450 GB of data on it. If you have two hard drives or flash drives that are listed as the same size but are different makes or models, you need to check how large both drives are down to the sector to ensure that the target drive is is the exact same size or larger. Can I use a solid state drive (SSD) with this hard drive duplicator? 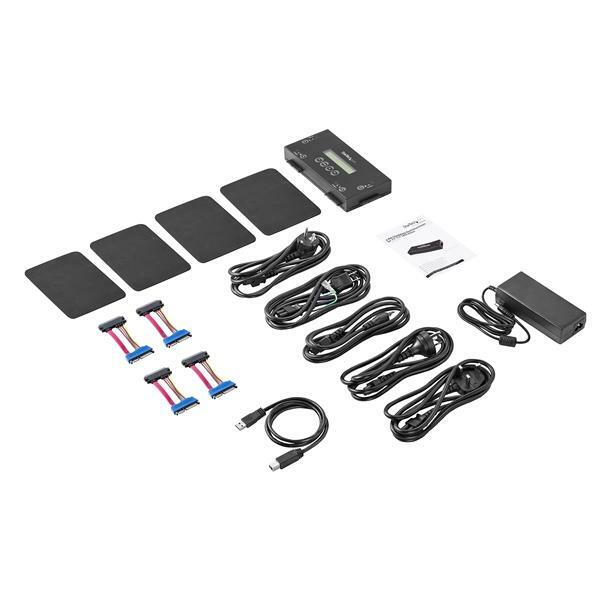 Solid-state drives (SSDs) use SATA connectors to access power and transfer data. 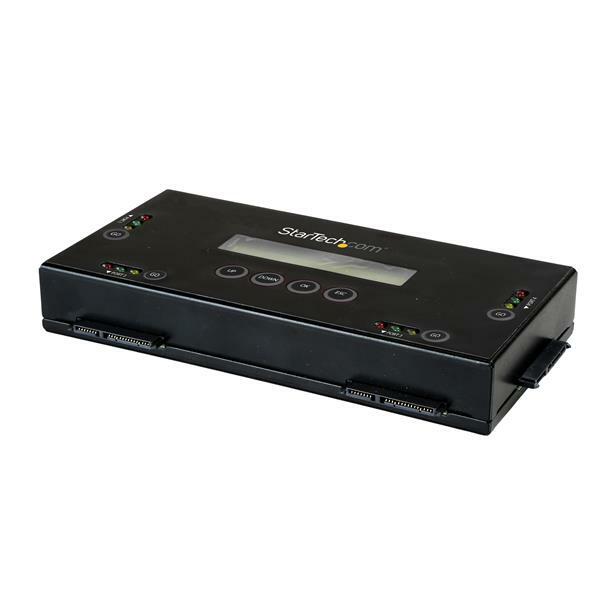 Any duplicator that can copy to or from SATA hard drives will work with a StarTech.com duplicator. Note: If you use a dock to duplicate SSDs, keep in mind that the StarTech.com disk duplicators execute a sector by sector read and write. SSDs are rated by a number of reads and writes. Repeated duplication and sector by sector reads and writes of SSDs can reduce the life cycle of the drive. Can I copy from a HPA partition or otherwise encrypted hard drive with this hard drive duplicator? Software-level encryption on the drive poses no issue to StarTech.com duplicators, as the duplicators copy encrypted data sector by sector over to the new drive. Hardware-level encryption or BIOS level hard drive locks cause the duplication to halt and fail, as the drive is unable to read or write the sectors that are encrypted. Duplication of Hidden Protected Area (HPA) Partitions or Extended Industry Standard Architecture (EISA) cause the duplicator to halt and fail, as the drive cannot read and write the protected partitions on the drive. Note: Our UNIDUPDOCK, SATDOCK22RE and SATDOCK4U3RE do include the ability to copy HPA partitions, but the duplication is still dependent on how the HPA partition is written to the hard drive, whether or not it is encrypted and how it is encrypted. Can I use this hard drive duplicator to copy from a failing or damaged drive? StarTech.com duplicators were not designed to recover failing or damaged drives. If the duplicator encounters a corrupt or unreadable sector, the duplication halts and fails. SATDOCK4U3RE, SATDUP13 ,and UNIDUPDOCK all include a function that allows the duplicators to skip over corrupt or unreadable sectors. However, if the duplicators encounter too many errors, they still halt and fail. If this happens, you will need third-party recovery software or custom-built recovery hardware to copy from a failing or damaged drive. How do different erase modes work? Quick erase and secure erase are functions the duplicators call on the hard drives themselves. How they work depends on the manufacturer of the hard drive. A Department of Defense (DoD) erase is a function performed by the duplicator where it does three passes. The first pass writes all 0s. The second pass writes all 1s. The third pass writes 0s and 1s randomly. Note: Not all duplicators will feature all of these erase modes. It is important to review the product manual to confirm the available erase modes. Do I need to format my target hard drive before I begin to duplicate it? You do not need to format your target hard drive before you begin to duplicate it, because the target hard drive is automatically overwritten during the duplication process. How do I get the full size of my hard drive after a duplication? The hard drive duplicator copies the exact partition from the source drive to the target drive. Since it is required that you use a target drive that is equal or larger in size than the source drive a portion of the target drive appears as free space. You can append free space to the live partition on the target drive so that the full size of the drive can be utilized. Note: A partition cannot be extended on an operating system drive that is in use. You must extend the partition when it not being used by the operating system, and ideally when it is still connected to the duplicator. Note: Do not extend a System Reserved partition. Only extend the primary partition, which is typically the largest in size and formatted with NTFS or FAT32. Type compmgmt.msc and click Ok. In Computer Management, on the left side of the screen, click Disk Management. Find the target drive. It will most likely be at the bottom of the list, have a partition that is the same size as the source drive, and have an unallocated area on the drive. On the target drive, right-click the last partition on the right side of the screen and click Extend Volume. In the Extend Volume wizard, click Next. By default, the remaining drive area is the amount of space used. The primary partition on the drive now uses the entire drive area. Is the source hard drive modified during a standalone duplication? StarTech.com hard drive duplicators only read from the source drive and only write to the target drives while in standalone duplication mode . A duplication that fails or halts will not cause a problem with the source drive. Can I use this device to duplicate an internal hard drive? You can use this device to duplicate an internal hard drive with the stand alone duplicator function if you remove the hard drive from the computer and connect it directly to this device.